is setting. Can you imagine the destruction if the mountain erupted today? As the weather was clear and the mountain top clearly visible we opted to ascend Vesuvius, the infamous (in 79 AD at least) and now a tourist destination that, along with now extinct towns of Pompeii and Herculaneum, now attracts million of visitors every year. The type of pressure buildup and eventual explosion that removed the top of Vesuvius seems very like that which happened at Mount St. Helens in Washington State. 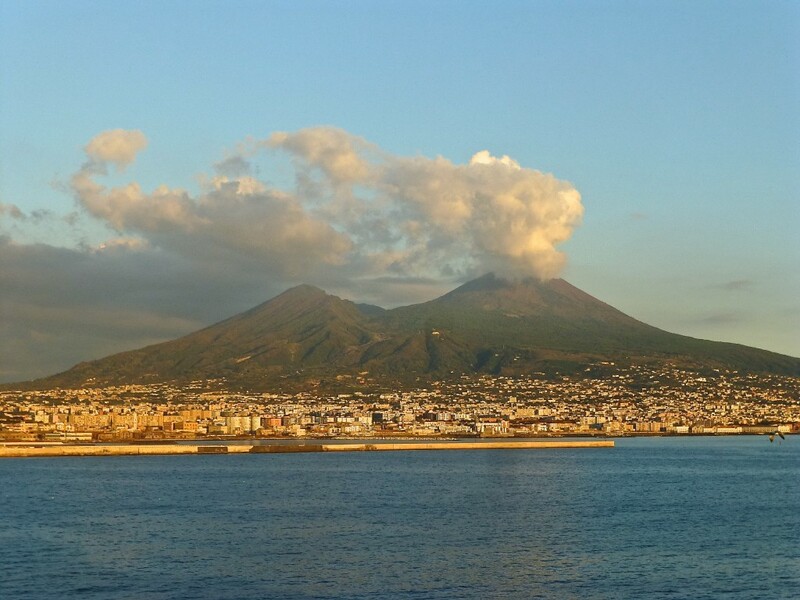 Today, Vesuvius is reported as being the most dangerous active volcano in the world. It has erupted hundreds of times over the past two thousand years, but the eruption on August 24, remains by far the most powerful. Had the mountain been in a remote area, it would likely have remained just a footnote in history, but by completely covering two towns and killing an estimated 16,000, it is a story that is now known around the world. With blast force of 100,000 times that of the Atomic Bomb, “Little Boy”, that leveled Hiroshima, it hurled ash over 20 miles and left a cloud that eventually circled the globe. Pompeii, the city to south, remains the most popular tourist destination as it was here a larger section of been recovered, however, it is said that Herculaneum has been better preserved as it was buried with the pyroclastic flow rather than ash. Another reason the sites remain so well known is that a young man, Pliny the Younger, made a commitment to his father (the Older), to make a record of the event. Pliny’s father had been killed in the aftermath of the eruption when he and a number of other men went to the Pompeii to try and assist survivors. Today we shall see some of the effects. As access to the mountain is rather rugged, we travelled south from Naples and then east to the base of the south section of the mountain (the taller of two peaks). After climbing the winding road to about half the height we transferred to a hummer type vehicle for the next 100 feet before taking to the walking trails. The final ascent of about 1000 feet winds along the western side of the mountain to the very edge of the cavernous crater that continues to spew steam. As we are travelling at the end of the tourist season, every stop we make is surprisingly clear of other tourists, so we are able to access every nook and cranny without having to wait in line. Along the path we meet a few others from other parts of the world and share a bottle of wine with an entertaining group of young helicopter mechanics working in Dubai and on holiday in Italy. Our tour guide, Roberta, provided us with a constant flow of information about the mountain, the city of Naples and it’s people. To bring life to the stories, the best guides always mix in a good portion of humour about themselves and their people. Roberta spoke fondly of her elderly mother who attends church at least once a week, yet is still a very superstitious persons, so much so that every time she leaves her apartment on her way to church, she always has a piece of garlic tucked in her bra. It was on the Isla of Capri, I first met her. Under the shade of the old walnut tree. I can still see the flowers blooming around her. Well, I can still hear Bing Crosby and later, Frank Sinata singing that song from somewhere back in my younger life. I am so grateful to have had the opportunity to take a trip to a great many places about which I have only read about or watched on TV or the big screen. Tomorrow we begin our trek through the Greek Islands and into Turkey as we make our way toward Cyprus and Israel.